TURN KEY OPPORTUNITY MEANS YOUR DREAM BUSINESS IS EARNING IMMEDIATELY! 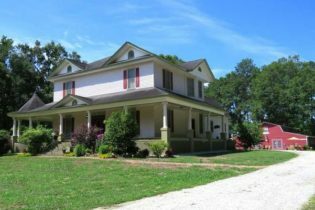 Unique opportunity to run a working Bed & Breakfast Inn AND successful Fine Dining Restaurant business near 11,400-acre Lake Greenwood, in the beautiful upstate area of South Carolina. This elegant vintage house was built in 1894, has gorgeous hardwood floors, character FP mantels, 9-13′ high ceilings, & has been carefully restored w/ updated electrical, plumbing, & sheet-rocked walls. B&B is 2 floors. Main floor has a Wrap-around Porch & 2 Front Parlors for guests, the rest is spacious private Owner Quarters that include 2 Bedrooms, 2 Baths, large Kitchen/Family Room, storage & utility rooms and private Back Porch. Upstairs is a central Gathering Room plus 4 paying Bedrooms/2 Baths for guests. The Restaurant is a character Red Barn directly behind the B&B, where guests enjoy gourmet breakfasts, & the doors open to the public for dinner, Wed- Sat., supported heartily by local residents. Nicely landscaped property of 3.75 acres (survey available) is surrounded by privacy trees & contains the main House, Restaurant, 2 support Outbuildings, Garden, & ample parking for 18 vehicles.Total square footage for the two businesses is estimated at 6088sf- 4212sf for the B&B, 1876sf for the Restaurant. Restaurant has an additional 1000+/-sf of nice unfinished space upstairs. All measurements are approximate. Price includes fully equipped/furnished Restaurant operation. B&B is being sold beautifully furnished, but sale price does not reflect B&B contents/furnishings, or misc. outbuilding contents, which can stay but must be via separate Bill of Sale. Lady Amelia is near a variety of recreational venues, including boating, fishing, jet-skiing on Lake Greenwood, numerous golf courses, cultural venues, & special events all over the upstate. Nearest city is the micro-metro City of Greenwood, about 20 min. away, known for its festivals, Uptown charm, quality healthcare & service amenities. Discover your new life in the beautiful lakelands area of upstate South Carolina, with four distinct seasons, super-mild winters, low taxes & low cost of living. Sellers will provide transition training as necessary. BUSINESS STAYS OPEN.